Holland College’s Automotive Technology program received a boost from Kia Canada recently through the donation of a new Kia Forte EX. The vehicle will be used as a training aid for students as they learn the mechanical skills to pursue their careers as automotive technicians. Kent Sheen, program manager for the Industrial Trades and Technology programs at Holland College, noted that support from the automotive manufacturers is integral to ensuring that the college’s learning environments replicate those of industry. 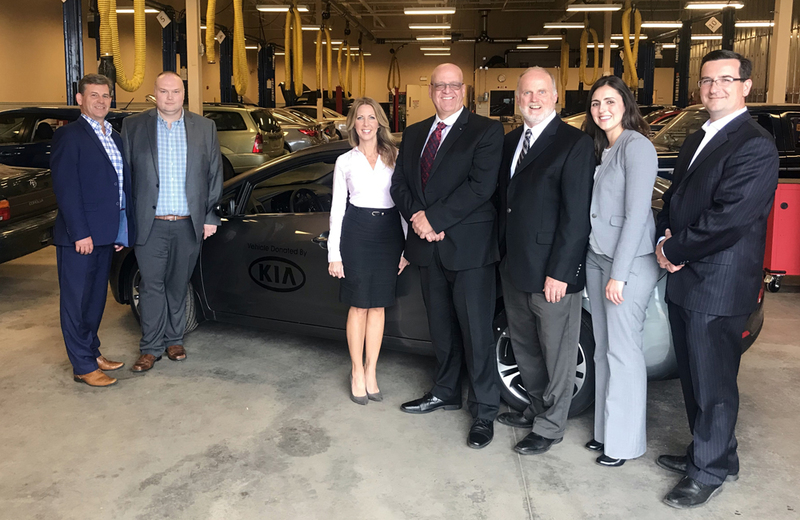 Reg Furoy, National Manager of Training with Kia Canada, noted that Kia is happy to enrich the learning experience of Holland College students. The Automotive Technology program is a two-year diploma program that operates out of the College’s Summerside Campus in Summerside. In this picture: (L-R) Bill Conrod, Regional Manager Atlantic region, Dave Brozek, District Parts and Service Manager Atlantic, Jo-Ann Campbell-Boutilier, Executive Director of the Holland College Foundation, Reg Furoy, National Manager Training, Kent Sheen, Program Manager, Industrial Trades & Technology and Computer Studies Holland College, Crystal Silveyra, District Parts and Service Manager Atlantic, and Tom Cahill, District Sales Manager Atlantic Region.